In order to Make the 200,000 turkeys ordered each year, Greenberg’s staff of 14 swells to nearly 200 during the holiday season. 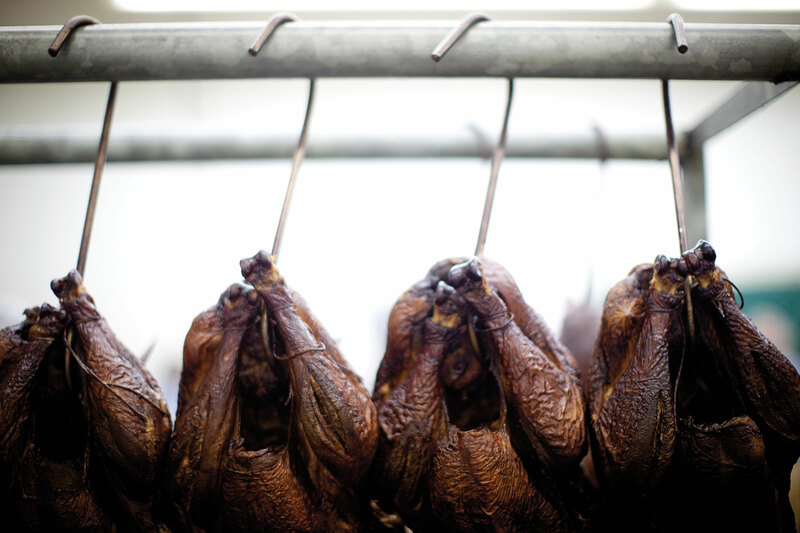 Want to feast on a smoked turkey of your own? Prices start at around $35 for a 6-pound bird (feeds 12 to 18) and go up to $80 for 15 pounds (feeds 30 to 45). It’s best to place your order the first week of October, but you can order as late as the Monday before Thanksgiving and still get your turkey on time. If you prefer to buy your bird in person, stop by the shop in Tyler, open 8:30 a.m. to 5 p.m. every day during the peak holiday season. If you miss out, don’t panic: you can order a turkey most of the year at gobblegobble.com. It’ll take one to two days to ship, and it’s recommended that you gobble it up within six to eight days. But Greenbergs were a holiday tradition among Texans way before Oprah came along. It started in the early 1900s, when Sam’s grandfather emigrated from Poland to Tyler with a spice rub from his grandmother. He used it to smoke turkey and other poultry for the community out of his dairy barn. Operations ratcheted up in the ’40s after a Dallas man who was a relative of a Tyler resident placed an order for six turkeys. Sam’s father, Zelick, who had taken over the family business, was up for the challenge of shipping them 100 miles. He gathered old boxes from the local candy store and packaged the turkeys in straw and sent them by train. The mail-order business was born. GreenBerg Turkeys get their famous almost-black color from being hung and smoked with hickory in a brick smokehouse for 14 hours. The turkeys are not organic, not free range, not heritage breeds, not insert latest trend here. They’re just prepackaged birds, like one would find in the grocery store. They’re sourced from Minnesota and range from a six-pounder to a 15-pounder. What makes Greenberg turkeys special is the preparation. 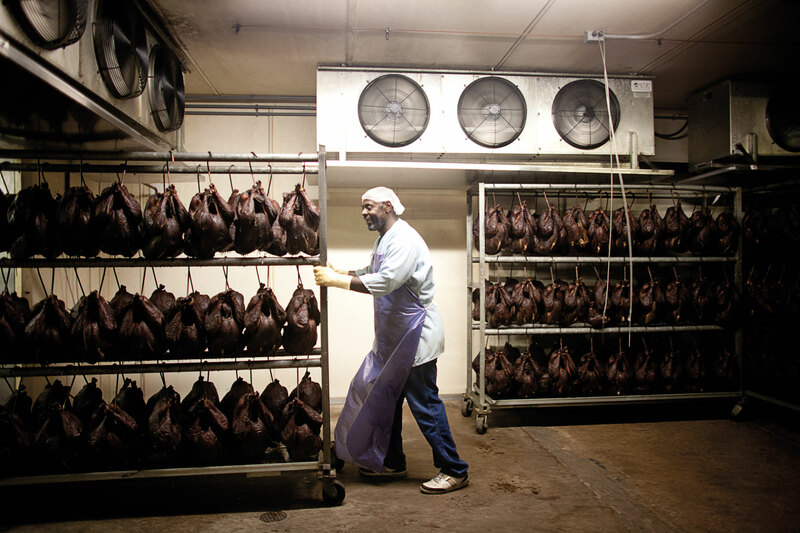 The birds endure a four-day cleaning, cooking, and packaging process that includes a full day of hanging from hooks in a brick smokehouse lit with hickory. They come out with their skin shriveled, looking almost black and nearly inedible, but that cleverly creates a natural wrapper for the moisture therein. The smell is seep-into-the-clothes smoky. Sam prefers to eat his with just mayonnaise. Even terrible cooks can prepare a tasty Greenberg. They arrive ready to eat by the time the UPS driver delivers them. Otherwise, put them in the fridge promptly and when ready to eat, just allow them to reach room temperature. No cooking required. Waited too long to place an order for your Thanksgiving celebration? Try Central Market—in select stores, Greenbergs can be found in the freezer section. The busy season runs from early October until Christmastime. A staff of 14 full-time, year-round employees swells to nearly 200. Turkeys are sold on-site during that period seven days a week (allow a 20- to 30-minute wait the Monday and Tuesday before Thanksgiving), but most clients order online, or return customers can place an order through a mailer sent the day after Columbus Day. Of the 200,000 turkeys ordered per year, half are shipped in state and the rest throughout the country.